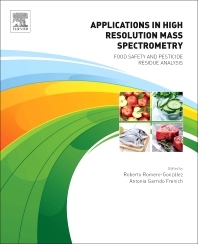 Applications of High Resolution Mass Spectrometry: Food Safety and Pesticide Residue Analysis is the first book to offer complete coverage of all aspects of high resolution mass spectrometry (HRMS) used for the analysis of pesticide residue in food. Aimed at researchers and graduate students in food safety, toxicology, and analytical chemistry, the book equips readers with foundational knowledge of HRMS, including established and state-of-the-art principles and analysis strategies. Additionally, it provides a roadmap for implementation, including discussions of the latest instrumentation and software available. Detailed coverage is given to the application of HRMS coupled to ultra high-performance liquid chromatography (UHPLC-HRMS) in the analysis of pesticide residue in fruits and vegetables and food from animal origin. The book also discusses extraction procedures and the challenges of sample preparation, gas chromatography coupled to high resolution mass spectrometry, flow injection-HRMS, ambient ionization, and identification of pesticide transformation products in food. Responding to the fast development and application of these new procedures, this book is an essential resource in the food safety field. Roberto Romero-González received his PhD in Chemistry in 2002 from the University of Granada, Spain. After two years postdoctoral work at the University of Lund, Sweden, he joined the research group “Analytical Chemistry of Contaminants” (University of Almería, Spain). Since December 2008, he has obtained several contracts (i. e. Ramón y Cajal Program) as senior researcher at the University of Almería. He is the co-author of more than 90 research papers published in international journals related to the determination of bioactive compounds, contaminants, and organic residues in environmental and food matrices, applying chromatographic techniques coupled to mass spectrometry analysers (high and low resolution). Antonia Garrido Frenich is full professor of Analytical Chemistry at the University of Almería, Spain. She heads the research group “Analytical Chemistry of Contaminants,” where her research is focused on developing analytical methods for the simultaneous determination of different classes of residues and organic contaminants in environmental, biological, and food matrices, based on the application of chromatographic techniques coupled to low and high resolution mass analysers. She is author or co-author of more than 240 research papers and book chapters related to these topics.